Publishing research that can be accessed as widely as possible is clearly crucial, but ensuring that research is accessible to similarly large groups of people is an altogether different challenge. The CC BY license, required by many funders when publishing open access, permits users to transform and build upon the licensed content, creating something new and original. Lucy Lambe explains how the LSE Library has worked with a comics creator and illustrator to create illustrated abstracts of articles that were funded to publish open access last year. This proved a rewarding experience for artist and authors, as well as an effective way of elucidating complex concepts. Two articles were chosen for this project, both of which the library has funded for open access publication during the last 12 months. The first, by Alpa Shah, focuses on the core of ethnographic research, participant observation; the second, by Steve Gibbons, Olmo Silva, and Felix Weinhardt, examines the effect of neighbourhood transience on teenage performance in school. The library’s next involvement was to connect the authors of these articles with a yet-to-be-commissioned graphic artist. 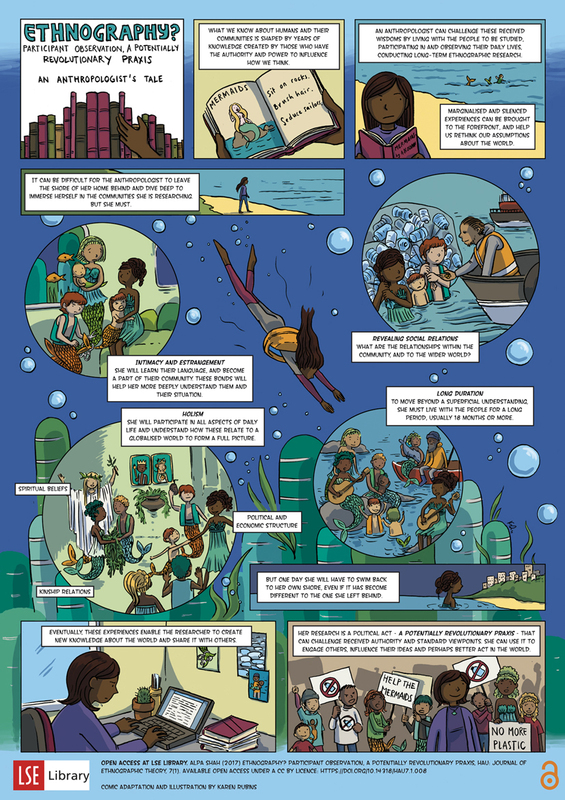 My experience as a librarian had provided little in the way of commissioning artists, so this was a little daunting, but fortunately I soon came across the work of comics creator and illustrator Karen Rubins and found her portfolio matched our requirements. 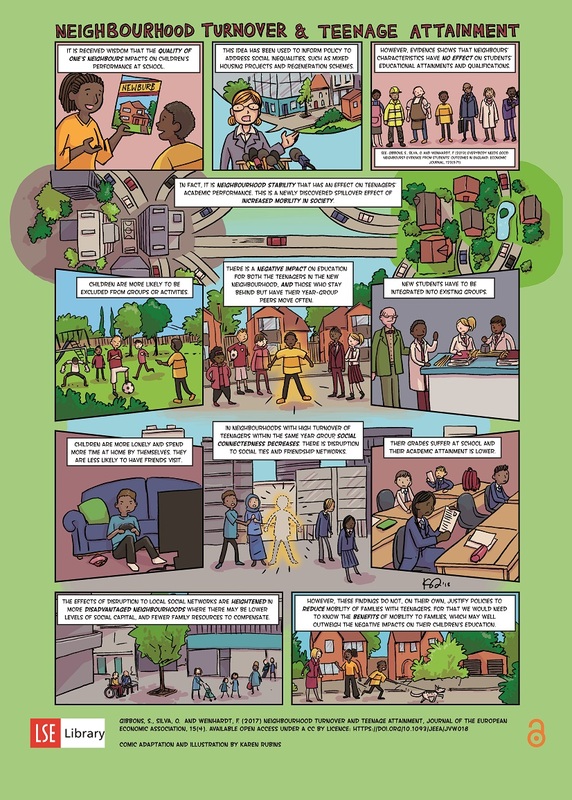 After hearing about the project, Karen agreed to take part and was ready and willing to tackle the challenges of working with academics to translate their research into a comic strip. Karen Rubins is a comics creator and illustrator living and working in London, UK. As well as writing and drawing, she runs workshops, clubs, and courses for all ages. She tweets @Kazmantra, and you can find out more about her work on her website. Dr Alpa Shah is Associate Professor – Reader in the department of Anthropology at LSE. She is the author of Nightmarch, a forthcoming book on the world’s longest-standing armed revolutionary struggle, the Marxist-Leninist and Maoist-inspired Naxalite movement in India. She tweets @alpashah001. Professor Steve Gibbons is Professor of Economic Geography in the department of Geography and Environment at LSE, and teaches urban economics, quantitative methods, applied spatial analysis, and Geographical Information Systems. Professor Olmo Silva is Professor of Real Estate Economics and Finance in the department of Geography and Environment at LSE. His research concentrates on the economics of education, the economics of entrepreneurship and urban and real estate economics. Dr Felix Weinhardt is Senior Research Associate in Applied Microeconomics at the DIW Berlin, Department Education and Family, and also an affiliate at the Centre for Economic Performance (LSE), and the IZA. Lucy Lambe is the Scholarly Communications Officer in the Research Support Services (RSS) team in the Library. The RSS team aims to support academics throughout the research lifecycle, and specialises in advice on publishing, open access and tracking research impact. CC BY is not the best license for scholars in the HSS fields, in part because under that license authors give up any control over how their writings are translated into foreign languages. A poor translation that distorts meaning can be a real disservice to a scholar’s career, and so it is important that authors have some opportunity to exercise control over that process.